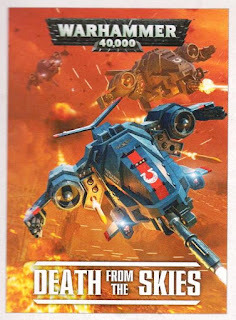 Welcome to the first part of my review on the new Death from the Skies supplement. 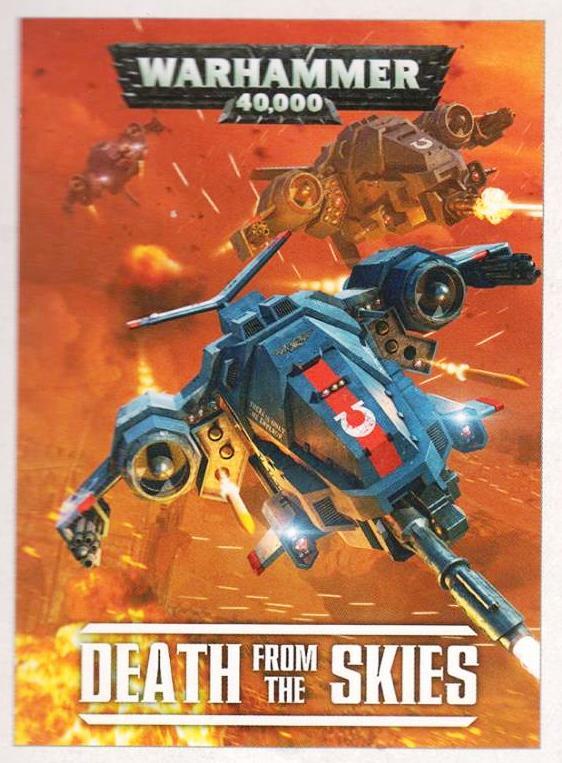 This new supplement greatly expands the rules for flyers in 40k, providing new special rules for using these unique vehicles and introducing some interesting new scenarios for players to use. I wasn't initially intending to purchase this supplement, but I saw a copy going for cheap-ish on ebay and decided to buy it. I have a few tournaments coming up and thought I would pick up the rules just in case they were in effect at the tournaments and I wanted to know what they were all about. This first part will look at some of the new rules introduced for flyers and the new flyer formations that have been introduced, known as Flyer Wings. The new rules for Flyers build upon the rules already presented in the 7th edition rulebook. The first new rules add additional characteristics for flyers in the game. These are Combat Role, Pursuit and Agility. Combat Role splits flyers up into three distinct battlefield roles; Attack Flyers, Bombers and Fighters. Attack Flyers are for going after ground targets (how I would generally field flyers in a battle), Bombers are for dropping bombs (ironic, isn't it?) and Fighters are supposed to target enemy flyers. The Pursuit value represents the speed of the flyer and is important for determining the attacker and defender in the dogfight phase (a new phase of the game that I will cover in the next review). Pursuit values range from 1 (for the cumbersome Astra Militarum Valkyrie) to 5 (for the sleek flyers of the Eldar and Dark Eldar). The Agility value represents the manoeuvrability of the flyer and is important in the dogfight phase for forcing your opponent to turn (making it more difficult for them to fire) or allowing a flyer to jink. These values range from 1-5. 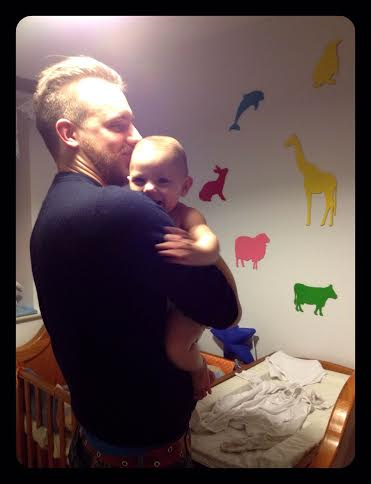 This week's Better Know a Blogger features Nathaniel (better known as NafNaf) from Objective Secured. NafNaf was actually one of the first bloggers that I met in the flesh (so to speak) after we faced one another in the first game of Blog Wars 9. 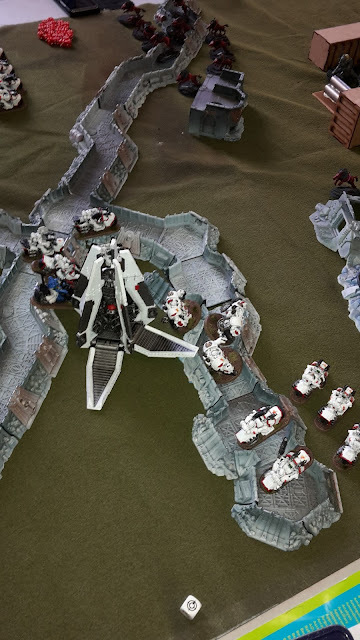 He was a really nice guy and we had a hilarious game full of awful dice rolling on both sides, where my White Scars tried their best to run away from his thunderwolves for the whole game. 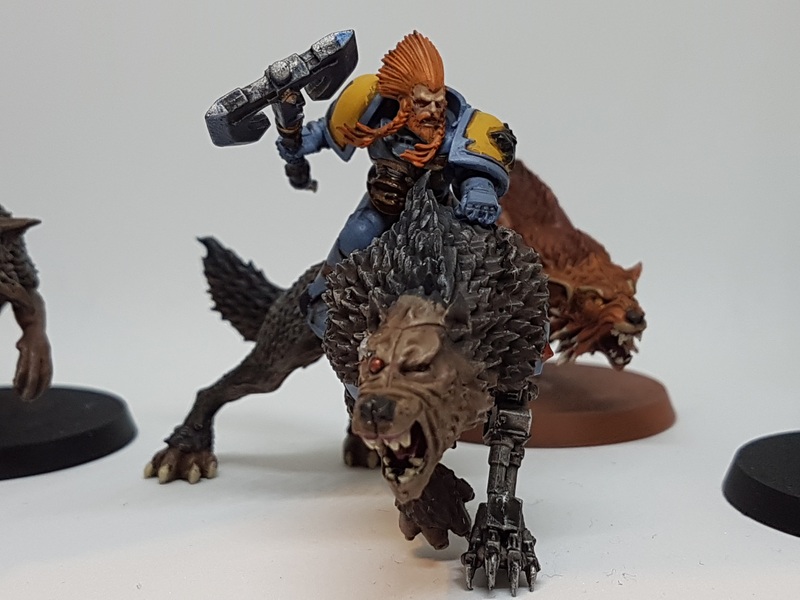 It was a real pleasure to go up against his awesomely painted and converted Space Wolves. I had already heard of his blog before then, but this helped cement it as one of my regular reads. Nathaniel (AKA NafNaf), I want to say on the left???? NafNaf is the founder (I believe) and one of the main contributors to Objective Secured, which if you haven't seen up till now, do yourself a favour and visit it now (though be prepared to lose several hours of your life). One of the major draws of the blog is NafNaf's phenomenal modelling and painting skills, with most of his posts focusing on his various models for different gaming systems. To me, the pinnacle of this is his most recent force; La Danse Macabre. Yes, believe it or not, this is a 40k unit. 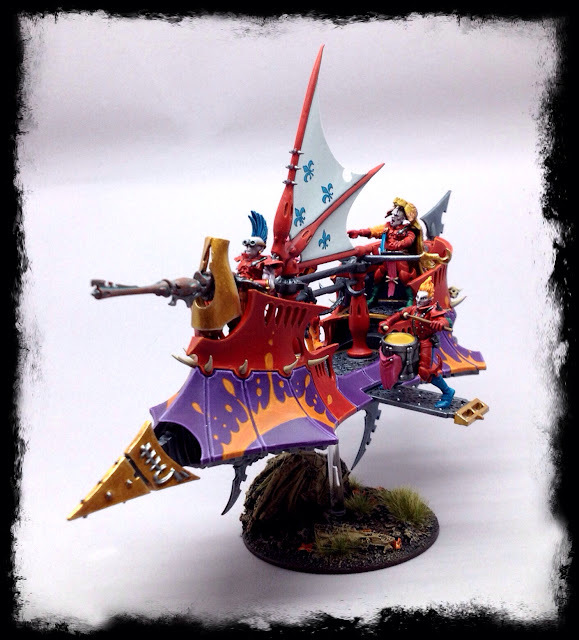 This is a Dark Eldar army that has been modelled and painted on a circus theme. 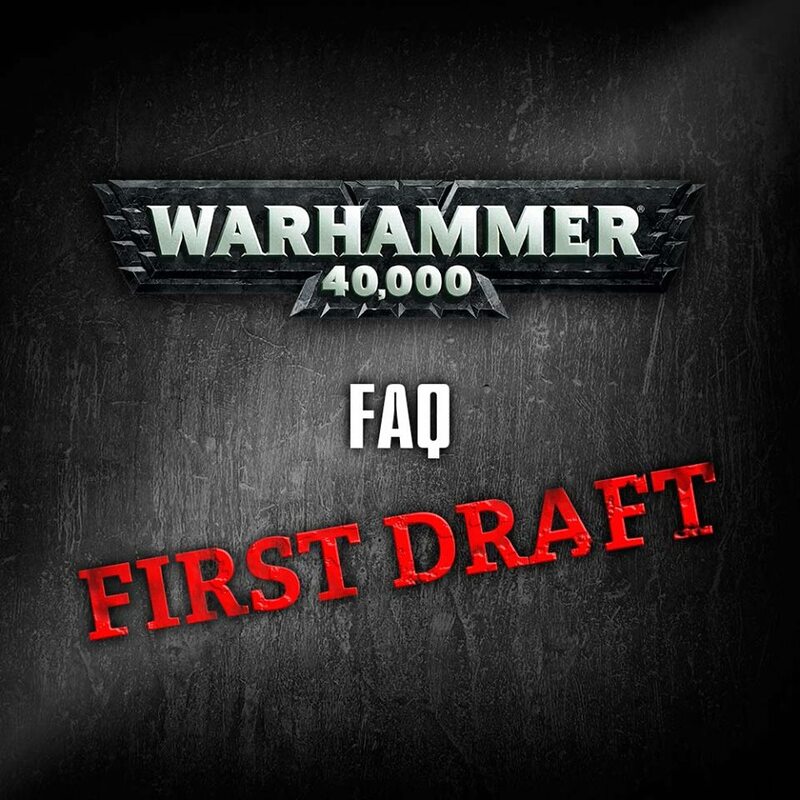 If that sounds ridiculous for the grimdark nature of 40k, you obviously haven't seen it yet. Featuring (in my opinion) some of the greatest modelling and conversion work I have ever seen for 40k, it is a truly unique force and showcases NafNaf's skills brilliantly. 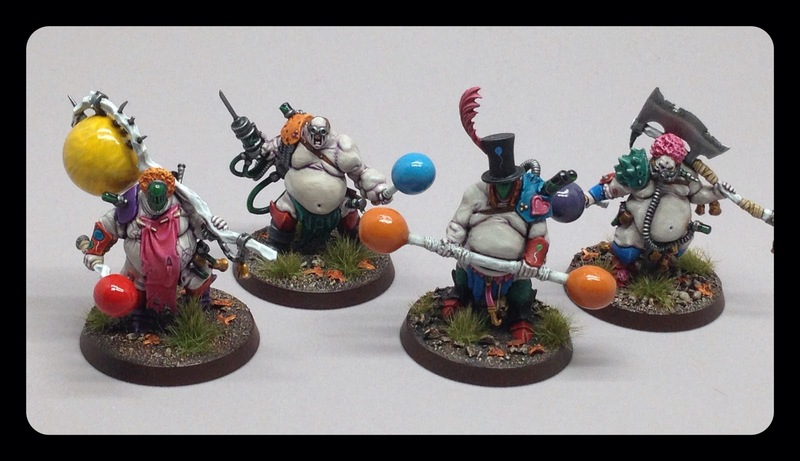 I always look forward to more work on the army popping up on my blog list and I cannot wait to see the force at the upcoming Double Trouble tournament in July as I am sure it is even better in the flesh (less than 2 weeks to go everyone!). His awesome Bjorn the Fell Handed conversion. Apart from 40k, you can find his projects on Infinity, Dropzone Commander and Malifaux, as well as some great tutorials and reviews. 1. What age did you get into gaming and what started it off? I had an intro into the wonderful world of tabletop wargames when a friend of the family mistakenly tried to engage my interest in model railways. I persevered for a while, finding various facets of it interesting but overall being pretty bored (they only go round and round, not so cool to a spotty 12 year old). A few years ago I had noticed a GW store in my local high street, but never had the courage to go in and see what it was all about. Having my appetite whetted by the hobby train experience, and starting to be interested in sci-fi, manga etc, I plucked up the courage and walked in, my what a wonder. All those cool models and artwork, my love of wargaming started at this very moment. The first model I purchased was a metal chaos marine standard bearer, and it was soon followed by the second ed box set and more metal chaos models. This foray was to last many years, until I went to uni and discovered booze and girls, and I abandoned my childhood pursuit of hobby glory. However I still had a secret interest, and soon found myself hiding in my bedroom painting a squad of space marines. My friends got curious and barged in one evening, and found me guiltily holding a paintbrush in the middle of applying a base coat to a melta toting space marine. Well the secret was out and there was no going back. 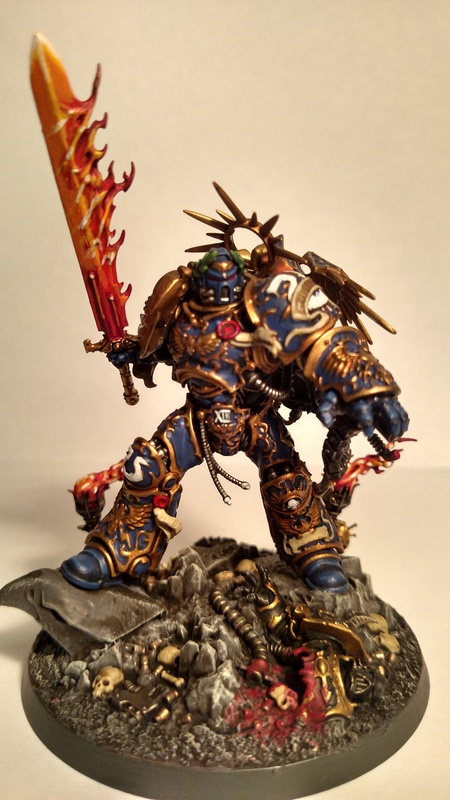 I continued to paint my space marines, and this soon escalated when I left uni and moved to a quaint town in the english countryside where I met like minded friends and hobbyists, and my passion for wargaming exploded. Back in August last year, I made a series of hobby goals for the upcoming year (based on Dave's series over on Confessions of a 40k addict). 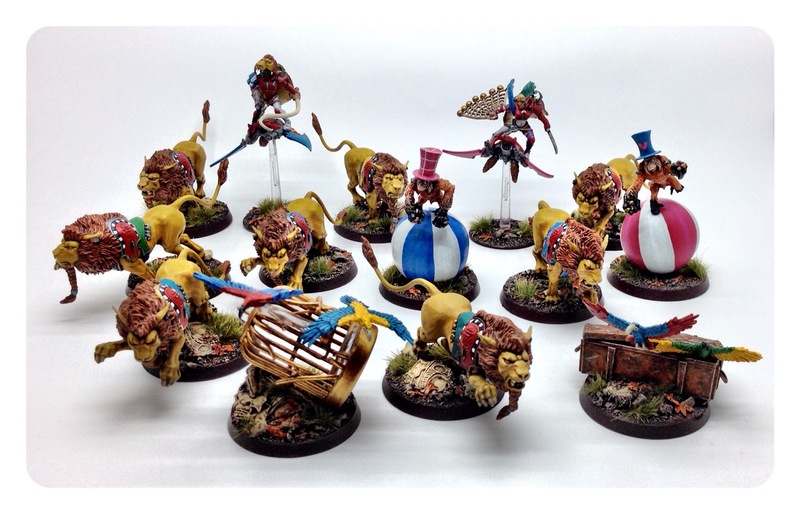 Recently, Rob posted his updated hobby goals and how he was getting on with them as the season comes to a close. Thinking of my own hobby goals, I have achieved quite a few of the ones on the list, but none of my goals related to painting have even been touched this year. One of my goals was to get my Vampire Counts army finished. With the release of Age of Sigmar, I am unlikely to purchase much more for my Vampire Counts army, so thought this would be the perfect opportunity to get the rest of my army finished and actually have a completed army! This is obviously a lot to do and I doubt I will get it finished before August (I have quite a few White Scars Scouts and transports to get painted before a tournament in July). While waiting for my White Scars units to arrive, I thought I would get started on some of the units in my undead pile. This week's battle report is a tournament practice game where my White Scars take on Innes' forces of Space Marines with an allied Imperial Knight. Innes and I are both attending Caledonian Revolution in the summer and I was interested in playtesting my army in the ETC mission format. I have previously discussed one of my proposed lists for the tournament. This is based on a Scarblade Strike Force with a Combined Arms Detachment thrown in as well to give me access to a Librarian and the Grav Centurions. My warlord trait was fixed with Khan (giving me re-rolls for morale and pinning tests and Scout moves for my bikes and transports). My Librarian decided to roll on the Technomancy table and got Subvert Machine, Blessing of the Machine and Warpmetal Armour. Not the best powers for my army, I was hoping for one of the haywire powers or auto-glance powers for taking on Innes' Knight (spoilers for below!). Warpmetal Armour could be useful for making my Command Squad even tougher. ATTEN-SHUN! Good grief, is that the best you can do, you 'orrible lot? I've seen Orks with better parade ground muster than that. Now listen up, boys, by the benevolence of the great God Emperor of mankind his very self, today we have a special guest to talk to you lot. A veteran of many a glorious battle. You listen up good and you wet behind the ears recruits might survive long enough to be of some use to the Imperial Guard. Here's Trooper from Cadian Shock. What do you mean "who's that"?- drop and give me 20 right now you sorry sacks of grot dung! 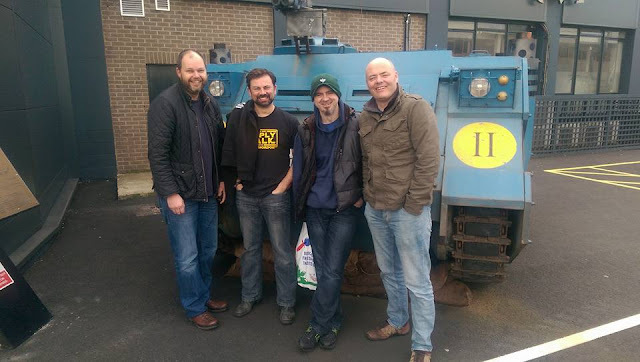 This week's Better Know a Blogger features Trooper from Cadian Shock/Warhammer 40K Blog. Cadian Shock focuses on Trooper's journey to build, paint and game with his Astra Militarum army. As he mentions below, it is very much a blog for beginners. What I like about Trooper's blog is that it is very much a detailing of his own hobby experiences about constructing his Imperial Guard army in all aspects. You can find articles on getting started with the Guard, his tips on batch painting Guardsmen, magnetisation of various tank models, as well as hobby progress posts on getting his army completed. In addition to all this, you will get regular army list postings to critique and improve, battle reports from his games and battle report Debriefs that look at how his army performed in the battle reports and what could be improved in the army. 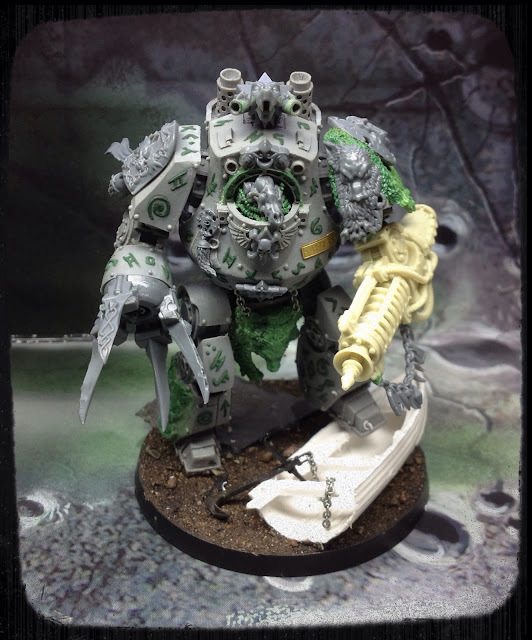 The blog reads very much like a player who is always evolving his army, looking at new unit combinations or trying out new combinations (including an attempt to make an Imperial Guard Deathstar of all things). One great series of articles worth checking out on the blog is his Social Media Guide. This gives you some very useful information on using social media to promote your blog or discuss hobby content online and was great for me when I was first looking into getting into blogging. In fact, I set up my gaming twitter account (@standwargaming) based on the advice from these articles. Trooper is also pretty active on twitter (@CadianShock) and you can often find him commenting and liking various tweets to do with a variety of 40k topics. 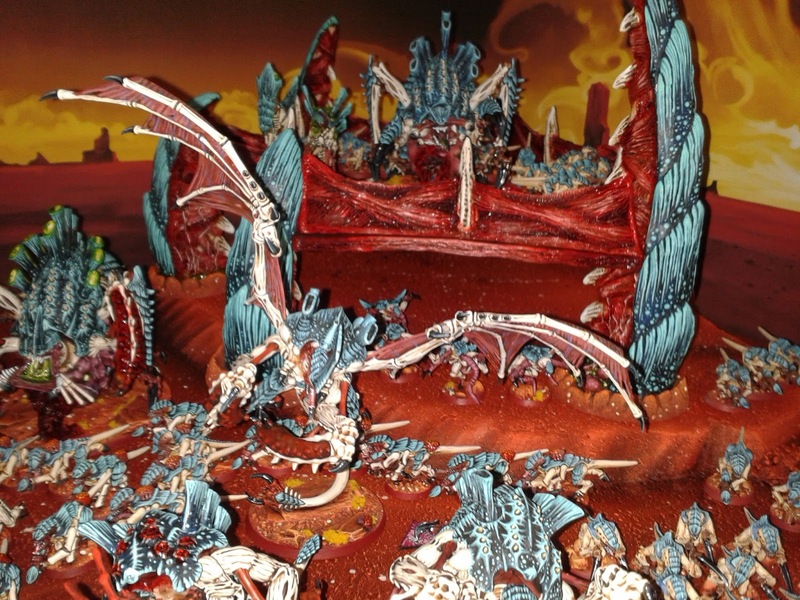 I started when I was around 7 and played/painted 40K until I was perhaps 15 or 16. I then sold everything for beer money, big mistake. 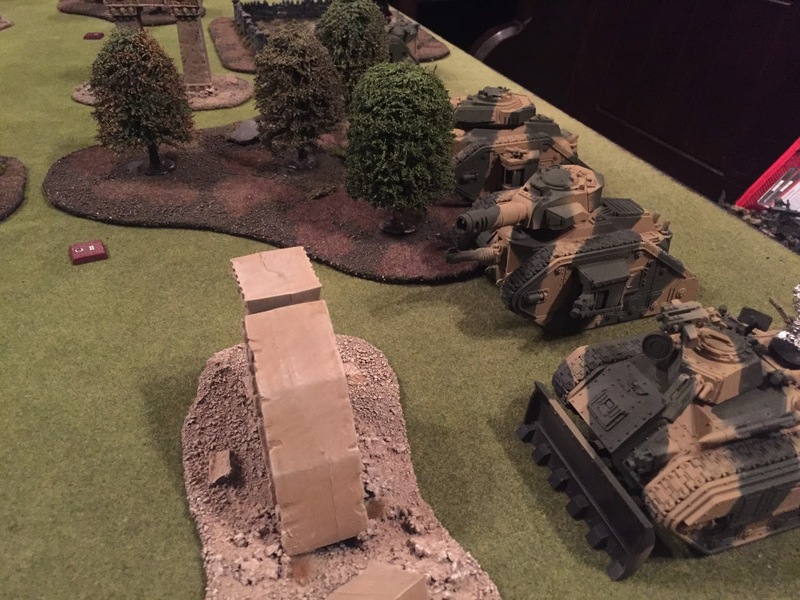 Two and a half years ago I restarted with the Imperial Guard and my blog. 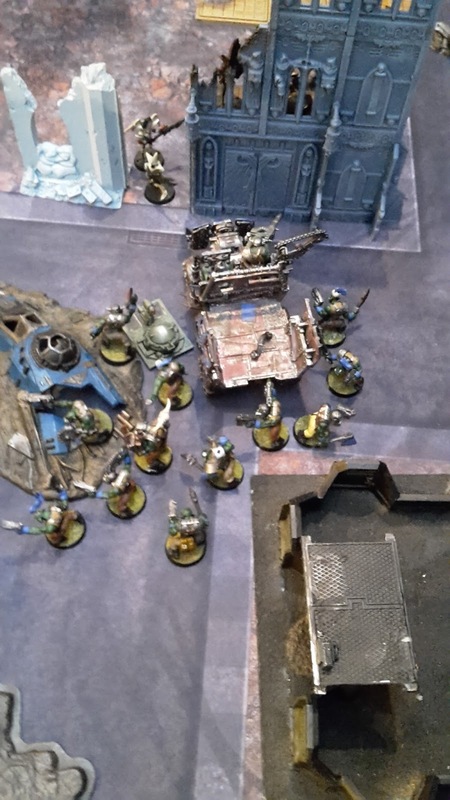 This week's battle report sees my Orks taking on James' Dark Eldar in the Contact Lost maelstrom mission. A little while ago, I posted my proposed armies up for the upcoming Double Trouble tournament. There was a huge outpouring for me to take my Orks along- they are an army that I have never taken to one of Alex's events so far and one that I don't get to play often enough. They are also one of my favourite armies to play as they are simply so much fun. I decided I will start playing more games with them in the run up to Double Trouble so that I can get used to their rules once more and start testing some additional potential lists. For my army, I decided to see if I could beat the puny Dark Eldar at their own game and went for a fast moving Speed Freaks type army, but with masses of bodies in true Orky style. I have signed up for the Caledonian Revolution tournament, taking place down in Stockport in July this year. This is a 5-game, 40k tournament using ETC missions, scoring and rulings. I have decided that I will be taking my White Scars to the tournament. They are by far my most competitive army and I am keen to see how some of the new formations will perform in higher points games. 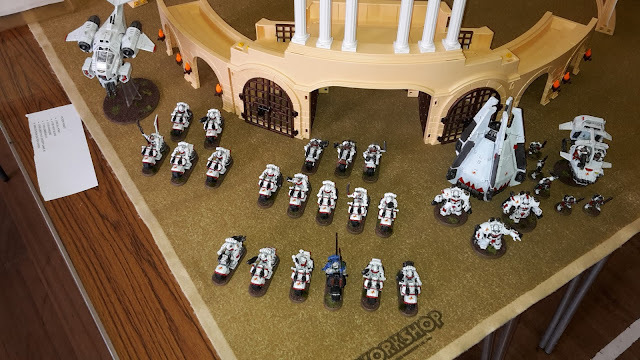 After looking through my tournament army reviews for Rapid Fire 2015 and the more recent Stronghold V, I have put together some initial lists for my White Scars army. I have a practice game this week at the club to test one of my lists. 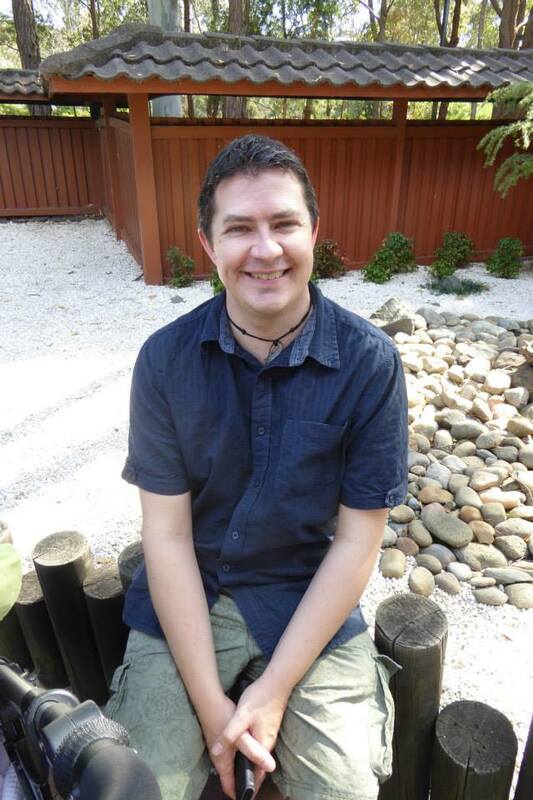 This week's Better Know a Blogger features Greg (AKA Greggles) from Feed Your Nerd, Greggles Tabletop. I think what first brought me to Greggles Tabletop was his vast array of Adepticon and Nova photos, and I doubt I am the only one. Adepticon is a massive wargaming event over in the US featuring thousands of players and a host of tournaments and games to take part in. 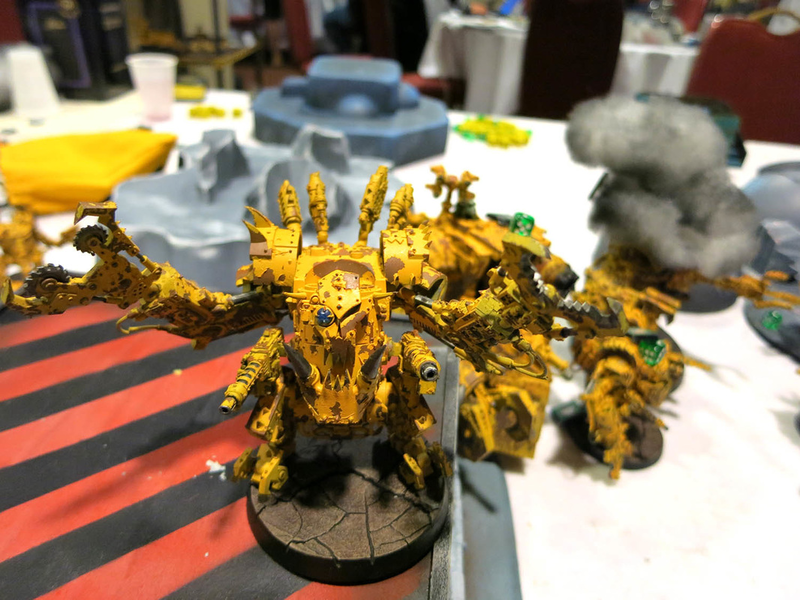 Every year, Greggles takes his trusty camera and takes hundreds of photos at Adepticon, featuring high quality shots of players' armies, ongoing games, special displays, etc. Every year, I pore over these glorious photos and it makes me extremely jealous that I will likely never attend such an event and get to see it first hand. 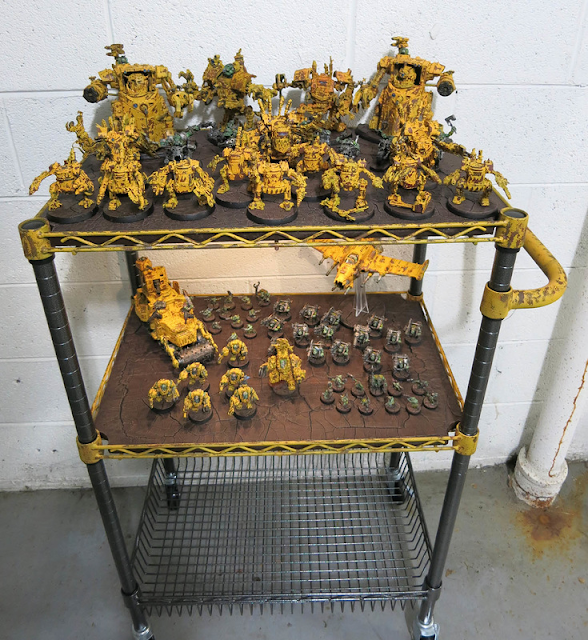 Not only does Greggles provide some great photos those of us on this side of the Atlantic to appreciate and comments for bloggers, he also has a fantastic Ork Walker army ready to clank and shuffle its way across the board. I don't know if this gives you some insight into Greggles' mind, but in an edition where Walkers are rubbish, Morkanauts/Gorkanauts are rubbish, assault is dead and Orks are a low tier fraction, he chose to combine all these aspects into a stunning Bad Moonz walker horde army- it's not about how many games you win, it's about how much fun you have and how fabulous you look doing it! So here are Greggles answers to my questions. I was an avid video gamer growing up. Lots of Atari, Nintendo, and eventually a PC as my interests in 3D design crossed over into art as well as gaming. For tabletop games, my adventures surrounded the game Battletech, and it’s 2d6 dice and hexagonal combat. I loved BattleTech, and even ran a tournament or two (with prizes even!). As I got older and got into school, it faded into the background. After many years the miniatures disappeared, and I mainly concentrated on gaming when I had time. This final part of my Angels of Death Codex supplement review will take a look at the Altar of War scenarios detailed in the book. These provide six mission for fighting with your Space Marine army and give a nice change to the regular Eternal War or Maelstrom missions you have no doubt played quite a few times in the main rulebook. This scenario represents a lightning attack by the space marines on the enemy forces. The marine player has to force his way into the enemy deployment zone, while the defender must rebuff the attack. This scenario uses three objectives; one in the centre of the board, one in the centre of the enemy table edge and the last one placed anywhere in the enemy deployment zone by the Space Marine player. The defender deploys first anywhere in his table half. The space marine player gets the first turn and enters play from the opposite table edge on the first turn. Units can Outflank (if they have the rule) and Space Marine units can deep strike on the first turn. Players score 3 pts for each objective held at the end of the game. Secondary objectives are Slay the Warlord and a bonus point for whichever player kills the most units during the game. In addition, all space marine infantry units get Objective Secured. I like this mission. It promises to be a very bloody affair and forces the Space Marine player to be very aggressive if they want to win the game as all the objectives are in the enemy deployment zone, but gain the benefit of access to more Objective Secured units. Welcome to next part of my Angels of Death Codex Supplement review. This section will look at the new Space Marine forces that were included in the supplement, those based on the models from the Betrayal at Calth boxed set. 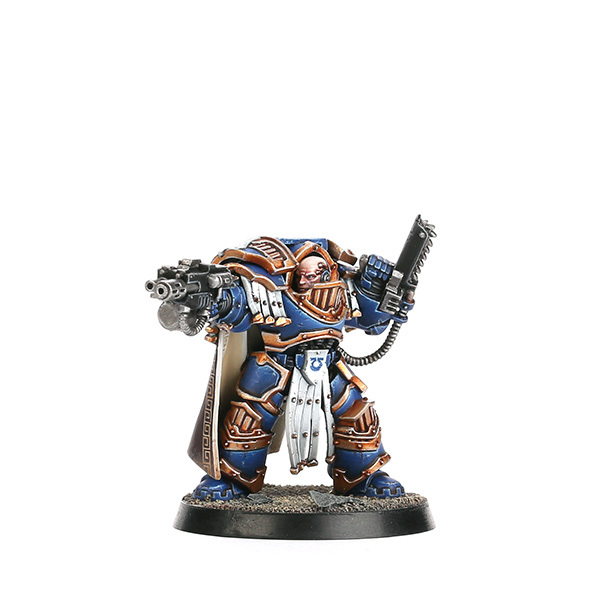 Comes with the Standard Space Marine Captain stats, with terminator armour, a power sword and a storm bolter for the same cost as the equivalent from Codex Space Marines. The big bonus here is being able to upgrade to Cataphractii terminator armour for free. 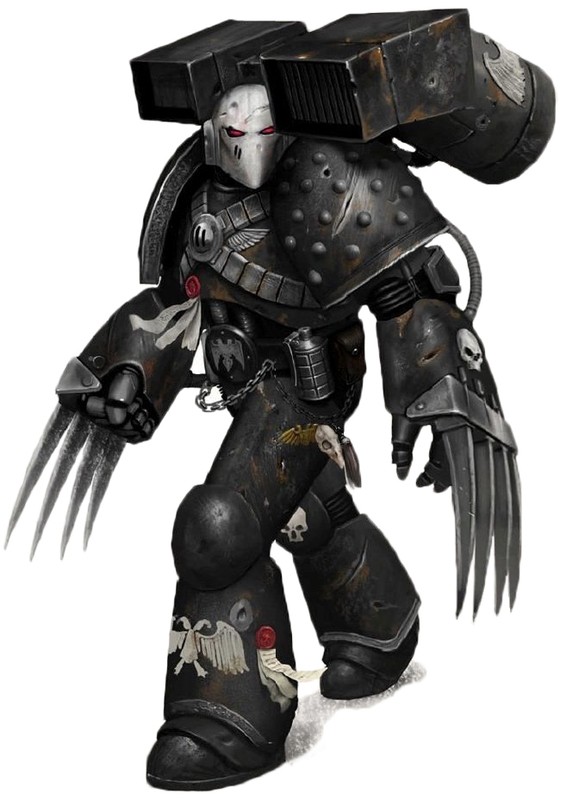 The Cataphractii terminator armour gives the Captain Slow and Purposeful instead of Relentless and no sweeping advances that normal terminator armour confers. The big bonus though is that it allows the Captain to re-roll invulnerable save rolls of a 1. So, a Captain model with a 2+ armour save and 4+ invulnerable save with re-rolls of a 1 is going to be pretty durable. Even though the text says the re-roll is provided by the interaction of the terminator armour and Iron Halo, it does not say the re-roll is restricted to the Iron Halo save. I have already faced a Cataphractii terminator Captain armed with the Shield Eternal, so granting a 3+ invulnerable, with re-rolls of 1's. For the free cost of the upgrade, I don't see why you would not do so. 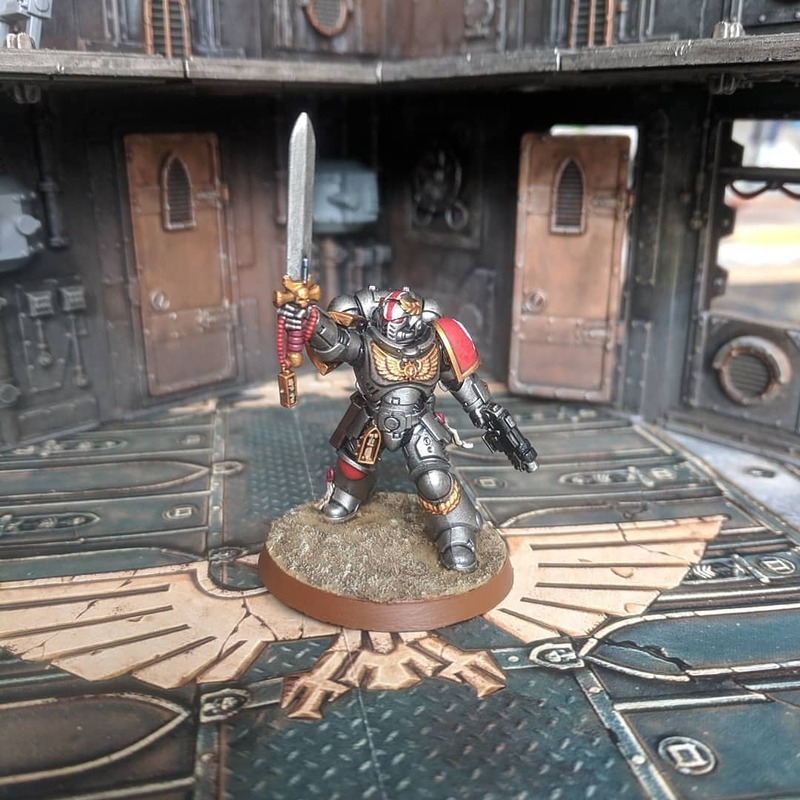 The Captain can also be armed with a Relic Blade, any Terminator Weapons, special issue wargear or any chapter Relics, but cannot be upgraded to a Chapter Master. Welcome to part 7 of my review of the Angels of Death codex supplement. This will be a short one, looking at the new formation for running a mechanised Space Marine army- the Anvil Strike Force. Like most formations of this type, it consists of 1-2 Core choices, 1+ Auxiliary choices and 0-2 Command choices. The Core choices are made up of either an Armoured Task Force or Land Raider Spearhead. 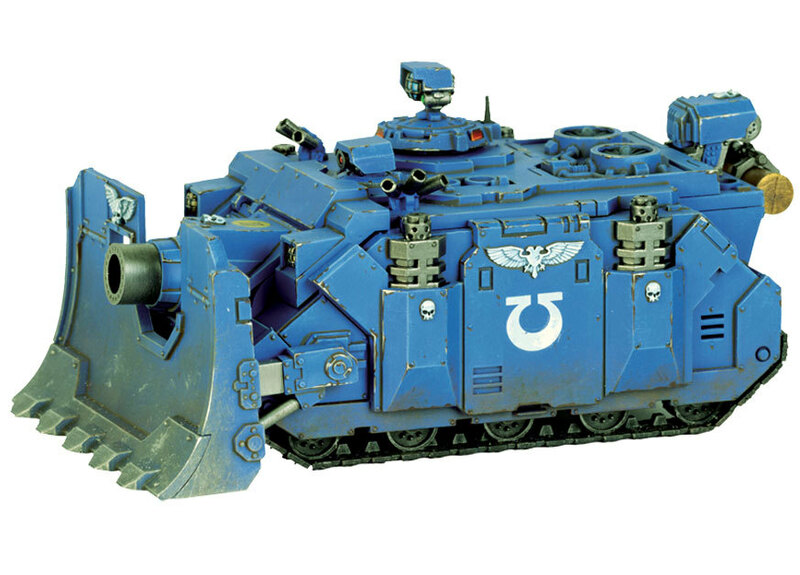 The Armoured Task Force consists of a Techmarine, 3-5 units of Vindicators, Predators or Whirlwinds, and the option to take up to three thunderfire cannons. 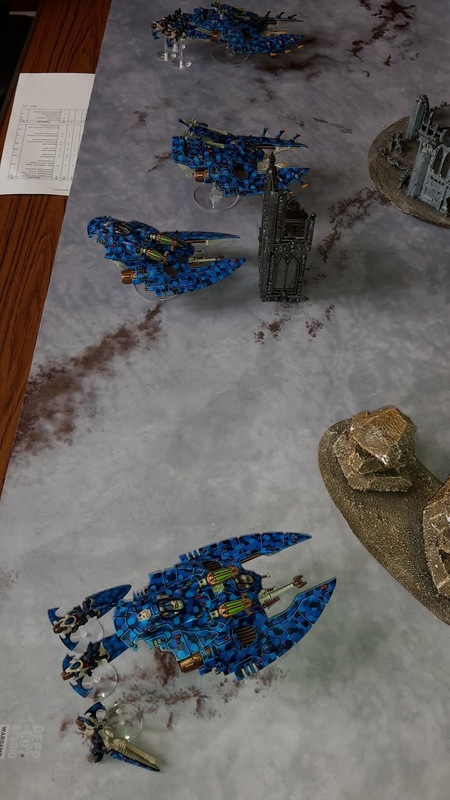 The vehicles in the formation get to ignore Crew Stunned and Crew Shaken results if in range of the Techmarine and the Techmarine gets a bonus to his repair rolls. 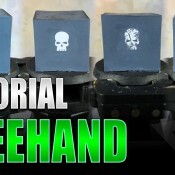 This is a great bonus that will keep your tanks moving and shooting. The Land Raider Spearhead consists of 3 Land Raiders of any kind. The Land Raiders get the bonus of ignoring all but Explodes results on the Penetration damage table if within 6" of another Land Raider from the formation and get to re-roll failed To Wound and AP rolls against Gargantuan and Super Heavy vehicles. This makes the Land Raiders in the formation extremely durable as only destroying them completely will stop them, and Land Raiders can be hard enough to kill as it is. Welcome to Part 6 of my Angels of Death codex review. This part will look at the formations for the Raven Guard (that can also be used by other Space Marine chapters) that were first introduced in the Kauyon supplement. Scout Support- Each Scout sergeant (or veteran sergeant) can spot for a unit in the formation if in range of the enemy unit. The unit from the formation gains Ignores Cover. This is a nice bonus for the formation, but will force your Scout units to get in close to the enemy in order to do the spotting, so makes them more vulnerable to charges. This will be very useful for a tooled up Command Squad or Devastator Squad or for Tactical Squads targeting light infantry in cover. This might be more useful for Scout Bikers, enabling them to close with the enemy quickly and for added durability if they are charged. EDIT- As Nick pointed out below, I misread the rules for Scout Support. The Scouts have to be within 9" of YOUR unit, not the enemy unit. This obviously makes a big difference to the durability issue as you will probably not need to close quickly with the enemy, but will need to stay close to your own forces. 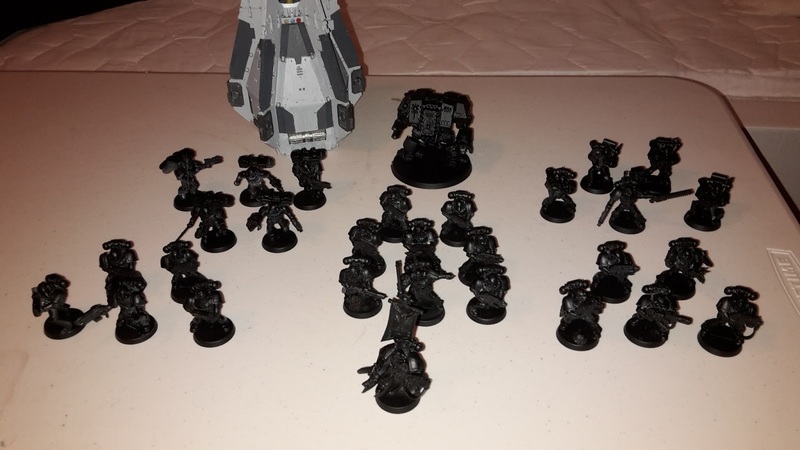 Also, check out Nick's Review of the Raven Guard formations (from someone who can actually read the rules before they review them!). Wayfinders- Each Scout or Scout bike unit can "lead" another unit on from reserve. You only make one roll for reserves, but the led unit can outflank along with the Scouts and gets Stealth if within 9" of the Scouts. This can be a great way for getting in on the White Scars' outflanking fun with your Raven Guard and ensure that your reserves arrive in force. 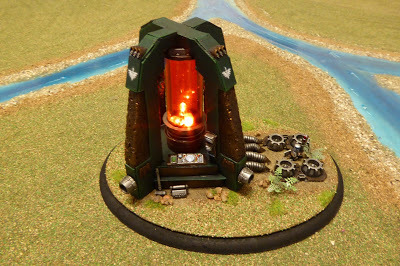 This would be useful for units embarked in a transport or on bikes for added mobility in the enemy deployment zone, as well as giving your led units a 3+ Jink or 4+ smoke launcher save the turn they arrive. A decent battle company formation for the Raven Guard (or other chapters), though you will want to take a lot of Scouts or Scout Bikers in order to maximise the benefits of the formation, potentially making this a very expensive force. If only this formation gave you Objective Secured as well, it would be extremely powerful. 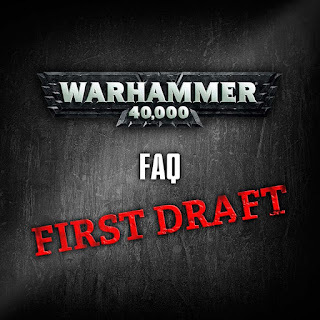 As you will all have no doubt heard on various parts of the internet, GW has released a first draft of its FAQ answers that it asked the community to contribute a while back. They have released this first draft to get feedback from the community about the clarity of the answers and to tweak any misunderstanding for the answers. I am going to look over some of the questions and answers that I found interesting and comment on them with regards to my own armies. Before we get started, I just want to say that I am loving the new direction that GW are going in at the moment. The decision to re-launch their social media profile and actively engage with the players is one that I wholeheartedly applaud and can only benefit the players. I'm hoping that most people can be civil and constructive to them and not scare them off into abandoning it again. I'm also loving the new games releases that seem to be flying out recently. I've picked up the Assassins game and just got a copy of Imperial Knight Renegade. This boxed sets are fantastic value for army building in 40k. I didn't pick up Betrayal at Calth myself, but I know plenty of people who did and used it to start some 30k armies. Anyway, onto some of the answers that stood out for me and how I think they will affect my own forces. Q- How many Hull Points does a vehicle lose when you roll two simultaneous sixes when using Graviton weapons? A- It loses three hull points. Anyone who has read my battle reports knows that I run a lot of grav for my White Scars. Most people accepted that rolling a second 6 against a vehicle and immobilising it for a second time resulted in an additional lost hull point (so 3 hull points for two 6's with grav). This new ruling makes no mention of what happens if the vehicle is immune to immobilised results, i.e. Superheavy vehicles. If this ruling stays the way it is above, then Imperial Knights just got more vulnerable to grav weapons! All you would need is 4 successful grav "wounds" to take out most Knights with this ruling. This will greatly benefit my White Scars if it remains the same. 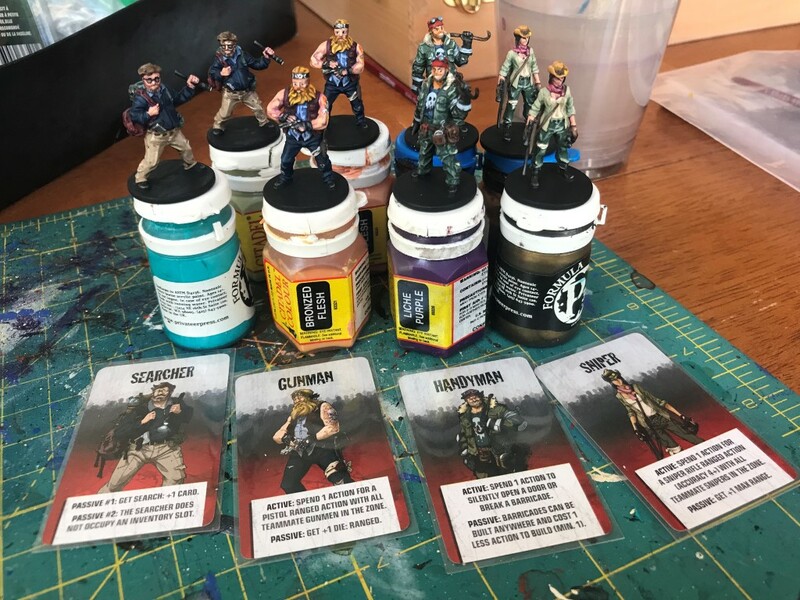 My competition to win a free Battle Demi-Company ended on Saturday. 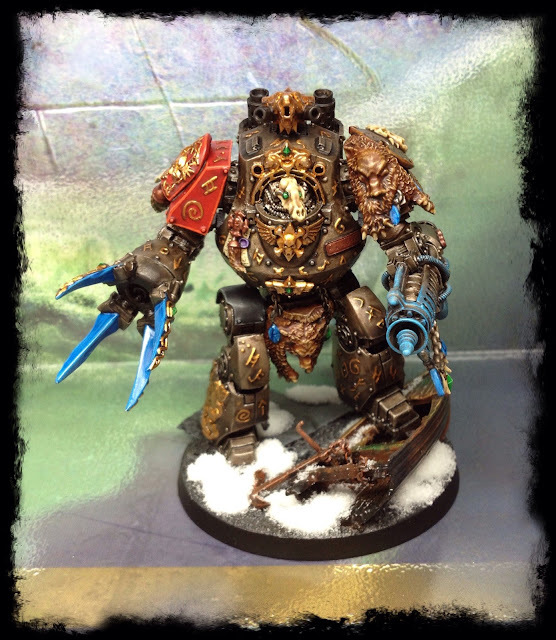 From the month of the competition, I got an amazing 55 entrants to try and win the models. I used a random number generator to choose the winner, and the winning entry was Number 51, Chris Deuell. If Chris could please get in touch with me using his Follower ID (so that I can verify it is him), I can arrange where to send the prize. This week's Better Know a Blogger featured Dave from Confessions of a 40k Addict. As I also said with From the Fang, I would consider Confessions of a 40k addict to be one of the UK's premier blogs (if not worldwide). In fact, if you google "40k blog", Confessions is the second result (with Faeit 212 appearing first), which is pretty damn impressive! Dave was also one of the people kind enough to give me some advice when I was just starting out, advice that I still try and follow today. After checking out Dave's blog, it is no surprise why it is so popular as it has varied content and showcases his amazing painting skills and scratch-built terrain. 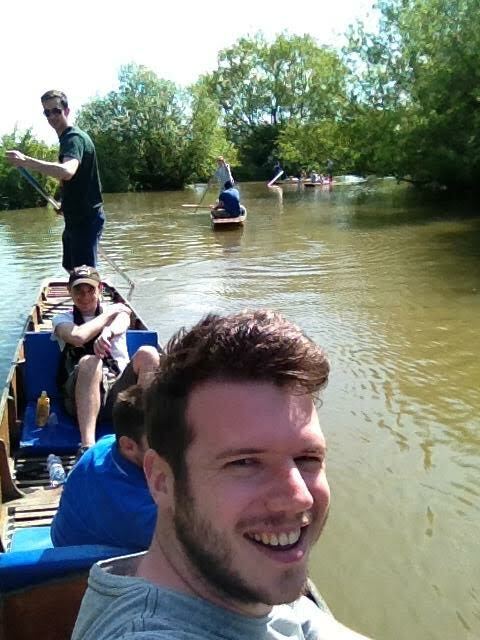 Dave and his gaming buddies (Dave is second from the right). I can't remember exactly what first brought Confesssions to my attention, but I have no doubt Dave's awesome Tyranid army was amongst the list. 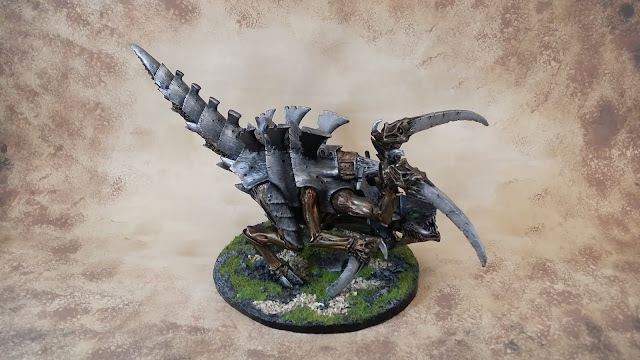 His Nids force is an absolutely stunning army (even better in person) and has won him several "Best Army" painting awards over the time I have been following the blog. In fact, I think Dave didn't enter his army into the painting competition at Blog Wars X as he was probably wanting to give someone else a chance! 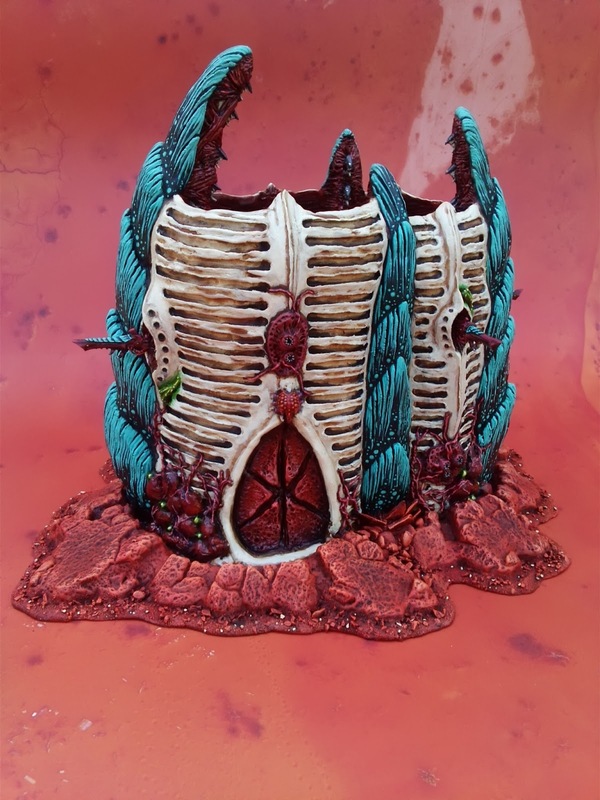 Not only does he have his brilliant Nids army, but has actually constructed some Tyranid-themed fortifications including a Bastion, Aegis defence line and the very impressive Skyshield landing pad. 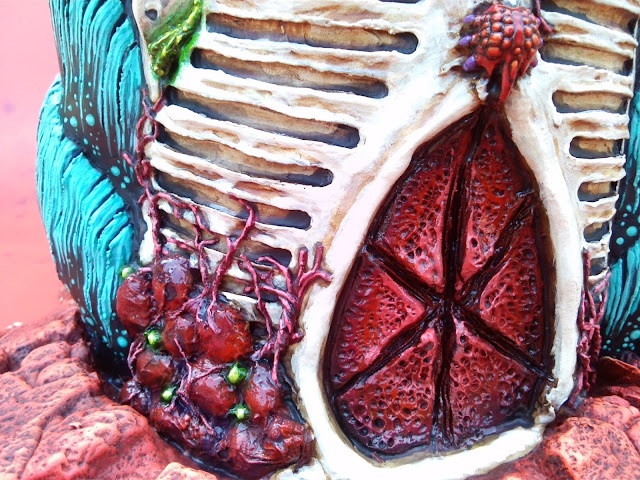 He is also currently working on a Nid-themed void shield generator to add to his impressive terrain collection. Here are some of the photos that I took of the different armies while at Stronghold V. There was a painting competition for the armies at the tournament, but very few people actually put out their armies for display and there were no entry numbers for each army, so I was not sure how I was supposed to be voting for the best army. Fortunately, I was planning on voting for one of my opponents in the end, so could just write down their name on the paper. Here are some of the armies I took pictures of during the day. As usual with any tournament I attend, I like to do a review of my army to see how well it performed and what could be changed. With the tournament being only 1250 pts, I wanted to go with a relatively cheap HQ unit and decided to go for a Librarian on a bike. He was upgraded to Mastery Level 2 and had the (almost mandatory) Hunter's Eye. As I had a few points left over, I also took the Mantle of the Stormseer to give some added protection against Psychic Attacks. The Librarian performed OK in the tournament. For most of the games he got Psychic Shriek and Prescience. I managed to get Psychic Shriek cast a few times, but failed to roll high enough to cause any damage with it, and managed to get Prescience a couple of times. I never even attempted to cast Psychic Maelstrom from the Mantle of the Stormseer (I struggle to cast warp charge 2 powers, so trying to cast a warp charge 3 power was asking a lot). The Mantle of the Stormseer was only really of use in game 1, where Innes was trying to target my bikers with Psychic Shriek. The other games, I was rarely targeted with psychic powers, so got no benefit from it. The Hunter's Eye performed brilliantly as expected. Using it with either the Command Squad or Centurions ensured that the grav weapons could do maximum damage each turn. I would say that the Librarian was only essential in the 4th game. Getting Invisibility was a game winner in that scenario and I was actually able to cast it twice in two turns. It would have been nice to have some sort of Invulnerable save on the Librarian. I kept him out of challenges for fear of losing warlord on him, but this generally resulted in the death of the Apothecary. I would probably have opted for Khan as my HQ unit if Special Characters were allowed, though I would have been unable to take the Hunter's Eye, which may have affected some of my games. If I was to redo the list, I would probably drop the Mantle of the Stormseer. Welcome to my final battle report from my games at the recent Stronghold V tournament. 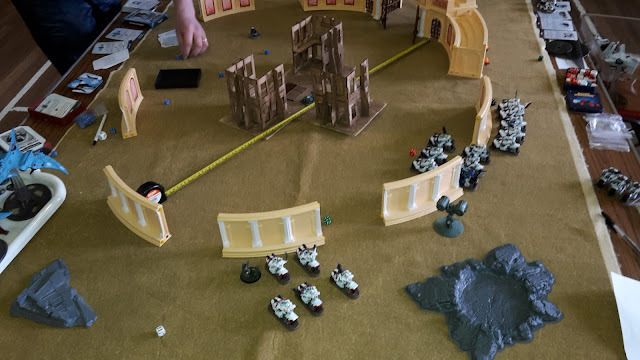 So far, my White Scars had managed two wins and one loss, so I was keen to see if I could secure a final win from my last game of the day. The final mission was a special Stronghold mission for the tournament. This consisted of a single, immobile Objective in the centre of the board. Players score a point for each turn they hold the objective. Additionally, if a player holds it for two of their consecutive turns, they also score victory points equal to the turn number. For example, if a player controls the objective for turns 2 and 3, at the end of turn 3 they would score a point for holding the objective, plus 3 additional points. This was an interesting one and I wished that I had playtested it before the tournament. I was unsure if it was better to hold the objective as long as possible or save my troops for the final turns to swamp the objective where the rewards were possibly higher. 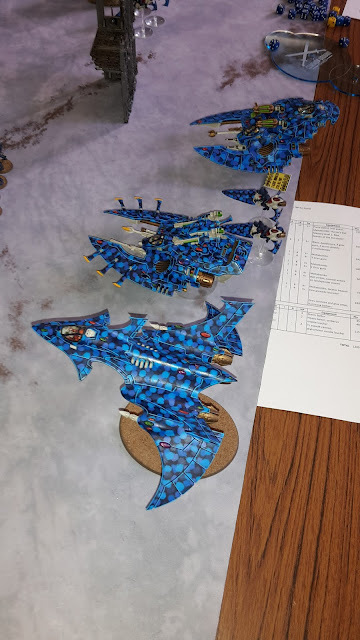 My opponent for the final game was Fin and his absolutely stunning Eldar army. I had been admiring this army during the lunch break and it was great to go up against it. My warlord trait was Merciless Warrior (re-rolls on sweeping advance). My Librarian's psychic powers were Psychic Shriek, Perfect Timing and Invisibility (I actually rolled it!). Invisibility was comp'ed in the tournament so that all units shooting/attacking the invisible unit were BS1 and WS1. 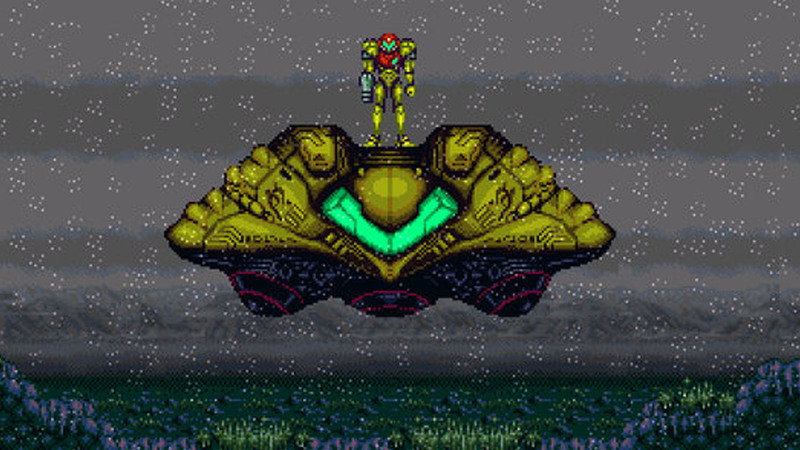 This meant I could still be hit with blast and template weapons. Welcome to the third battle report from my games at the recent Stronghold V tournament in Glasgow. With two wins under my belt, I was currently sitting in second place overall, so I knew my third game of the day would be tough. The third mission was Purge the Alien with Hammer and Anvil deployment and I would be facing Martin and his Daemons of Chaos. 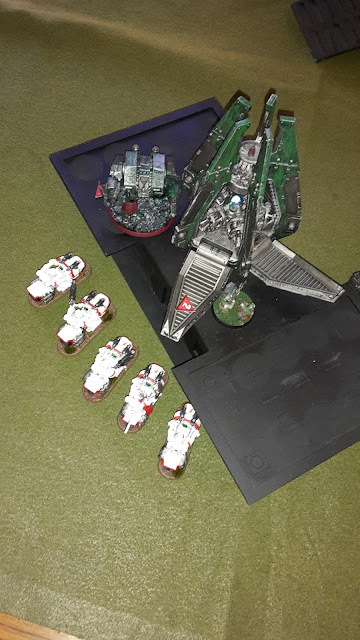 I had previously played Martin at Rapid Fire 2015, where his Necron Decurion force demolished my White Scars in the Purge the Alien mission. I was a bit more hopeful about this game as Daemons are at least killable. My warlord trait was Master Rider, giving me +1 to my jink save. My psychic powers for this game were Psychic Shriek and Prescience. Welcome to the second battle report from my games at the recent Stronghold V tournament. After a great result in the first game, I found myself up against Aiden's fantastic blue Eldar army in the second game of the day. The second mission was Crusade with 5 objectives and Vanguard Strike deployment. 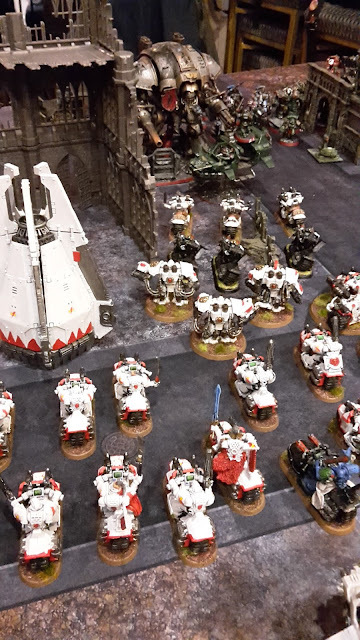 This is a good mission for my white scars, I could use my mobility to grab the objectives at the end of the game, assuming I could survive long enough to be able to do so. My warlord trait was Merciless Warrior, giving me re-rolls to any sweeping advance roll. My psychic powers for this game were Psychic Shriek and Prescience. This is my first battle report from the recent Stronghold V tournament that I attended in Glasgow. This tournament was for 1250 pts made up of a Combined Arms Detachment (with optional allied detachment) and would be played out over 4 different missions. I have previously discussed some of the rules of the tournament and my initial list for my White Scars. The first mission of the day was the Contact Lost maelstrom mission. This mission allows you to draw a card for each objective that you hold at the start of the turn, so it is important to try and hold the objectives while also scoring your maelstrom cards. I was hopeful that my fast moving, objective secured army would do well in this mission. For my warlord trait, I rolled on the tactical deck and got Master of Fate, allowing me to re-roll the victory points result for a maelstrom card where a random number of points is required. I liked this as it can be annoying to constantly roll a 1 on all your D3 victory points re-rolls for maelstrom cards. My Librarian got Psychic Shriek and Prescience for his psychic powers. This week, Marc from "Old School Gaming" took the time to answer my questions for Better Know a Blogger. Marc blogs from the other side of the globe, writing and gaming from Sydney, Australia. 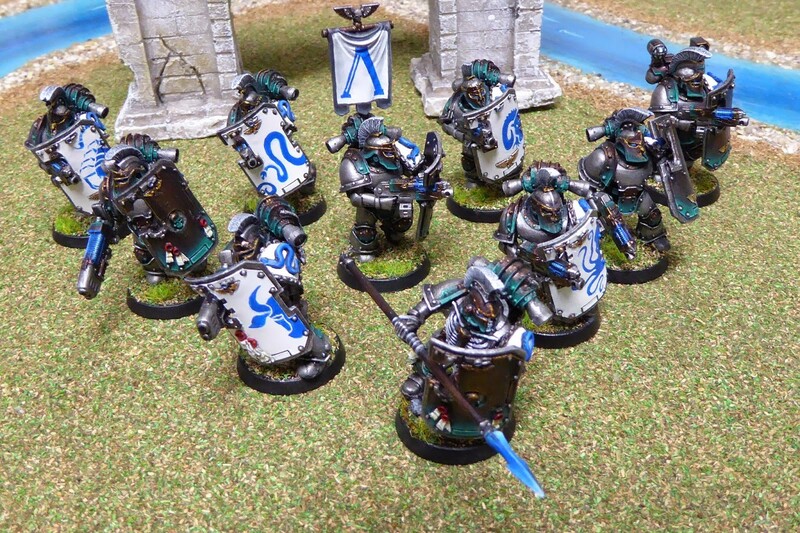 I think what first brought me to Old School Gaming was a picture of Marc's Iron Snakes Sternguard squad. The combination of the unusual models with their Greek warrior feel and the amazing paint job were enough to get me to click on the link and his blog has been part of my blog list ever since. "This is where we stand! This is where we fight!" Like any good 40k player, Marc also has a Dark Angels army that receives just as much care and attention as his Iron Snakes, with the most recent focus being on completing some Ravenwing bikers to add to his collection. 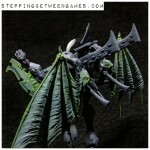 He also does some great work on his Tyranids and a very special Guard army (more on that below). 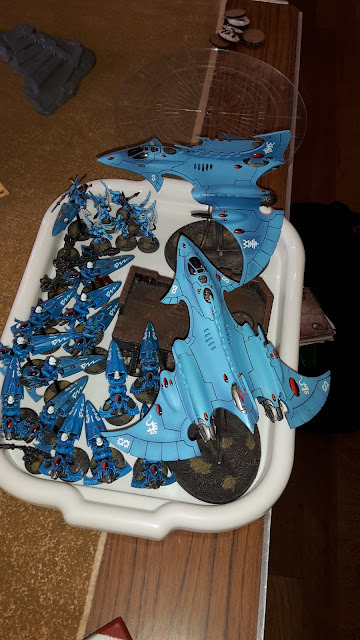 Not content to have just this many 40k armies on the go, his blog also frequently features articles on X-wing and Battletech. 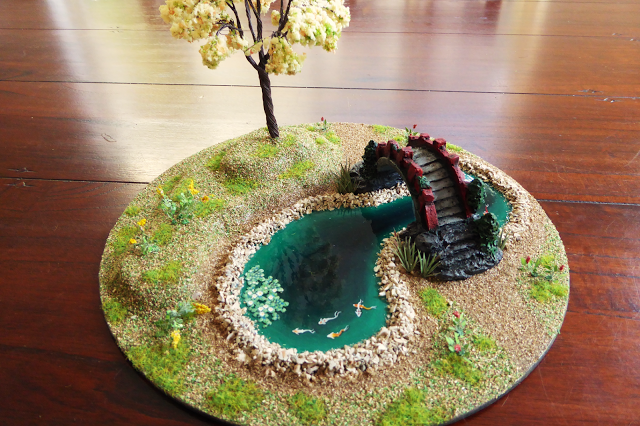 He also constructs some amazing terrain pieces as well. Most recently this has included his Japanese garden and his brilliant Dawn of War plasma generator (which featured as his entry into Confession of a 40k addict's Imperial Knight prize giveaway). EDIT- Marc actually ended up winning the competition with his plasma generator! In fact, Marc was the first ever comment on my blog. This was on my second post describing how I got into wargaming, where he mentioned that he once had a 7000 pt fantasy battle using not a single miniature, but folded paper models. He has been a regular contributor to the comments section ever since. As you can see, Marc's blog is well worth a look. He took some time out from creating these amazing pieces to answer my questions. In ’96 a couple of mates taught me how to play 2nd Edition 40K during a camping trip; I was 15 years old. The game sunk it’s hooks into me pretty deep! The guys were very patient with me and focused on developing strong narratives in their games. Looking back now, I can see how those early experiences have shaped me as a member of the gaming community.